August 25 2016. Over a hundred speedy Masters Distance Runners are arriving in Flint Michigan to participate in the National 1 Mile Road Championship this Friday, August 26th. The Masters Grand Prix starts up again after taking much of the summer off. 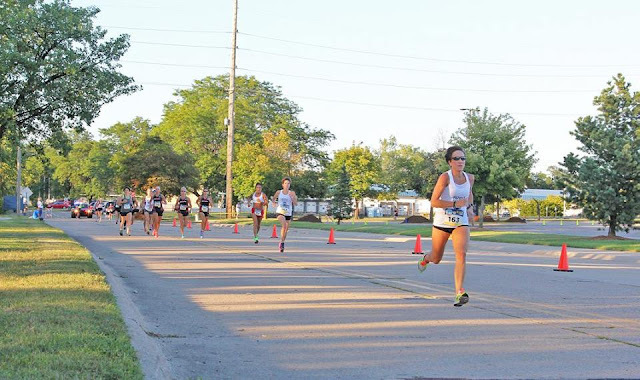 The 5th stop on the Individual Circuit this year, the Grand Prix will continue with road races in Syracuse NY (5K) on October 2nd, Tulsa OK (15K) on October 29th and with the Masters 5 km XC and Club Cross Country in Tallahassee FL on November 6th and December 10th. 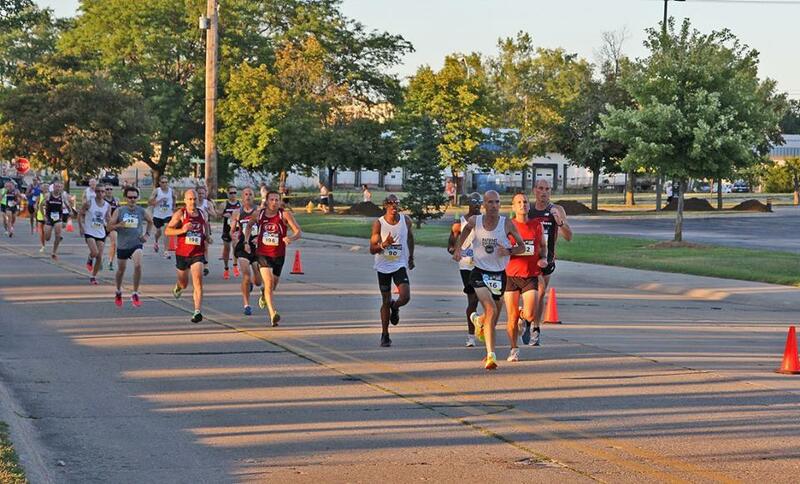 The USATF 1 Mile Championship is part of the CRIM Festival of Races excitement for the third straight year. 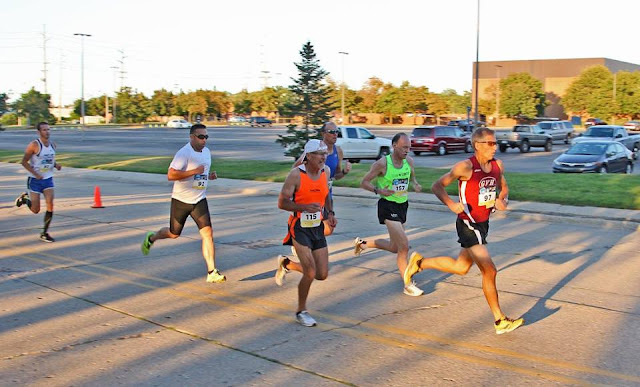 Many runners will compete in the 1 Mile events Friday night, catch a little shut-eye and be up in the morning for the signature event of the HealthPlus CRIM Festival, the 40th running of its 10 Mile Run. The Masters Races go off at 6:30 pm (Men) and 6:45 pm (Women). The 1 Mile course essentially traces a rectangle around the University of Michigan-Flint campus except that you continue on an extra block before turning to finish up just beyond where you started but a block further north. The times are not typically fast but the long, straight run into the finish can be very exciting. Individual and team titles are on the line, as well as points for the Grand Prix. The weather is forecast to be pretty good for a 1 mile run, with sunny skies and a temperature in the upper 70’s to low 80’s, with moderate winds. Were the race longer the temps might be worrisome but for a one mile jaunt it should be manageable. The previews and predictions below are offered in good fun and with the understanding that predicting is tough. Occasionally I am provided with inside information on a runner who is subpar or has had to withdraw but generally the race-specific runner fitness is unknown in advance. First are the Individual Races and then the Teams. Women. Last year Tammy Nowik enjoyed an easy victory by comparison, taking first by 12 seconds in 5:29. The race between Serena Kessler and Lisa Veneziano was closer but Kessler was able to open up a gap and take second by 4 seconds over Veneziano. The two Patient Endurance Racing teammates from Michigan, Nowik and Kessler, as well as Veneziano are entered again this year. And there are two newcomers from out of state who are likely to give Nowik a real race for the Gold this year. Melissa Gacek is traveling from White Bear Lake, Minnesota and the USATF Women’s 50-54 Division Runner of the Year, Marisa Sutera Strange, hails from Pleasant Valley New York. 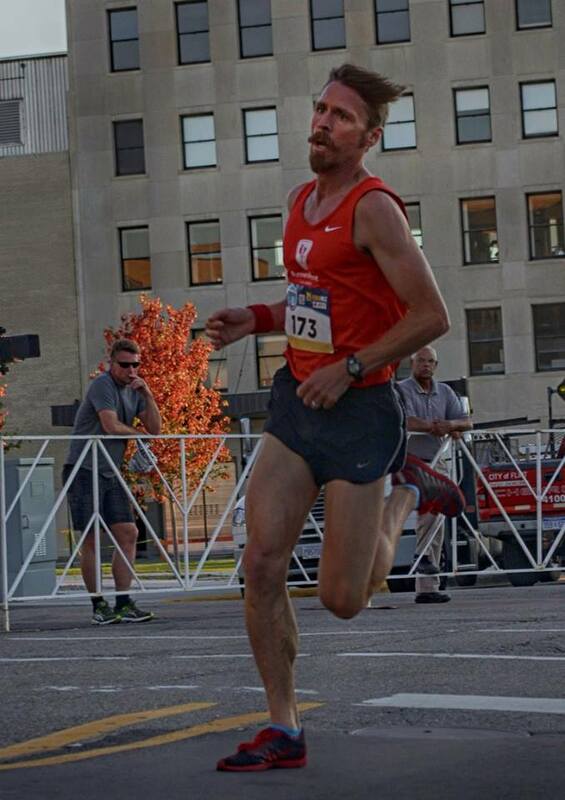 In addition to winning this mile race last year, Nowik had subsequent successes, including a 5th place finish in the 2015 USATF Masters Marathon Championship at the Twin Cities [Oct] in 2:53:41 and a first place masters finish at the 2015 Indy Monumental Half Marathon a month later in 1:22:48. So we know she has staying power. 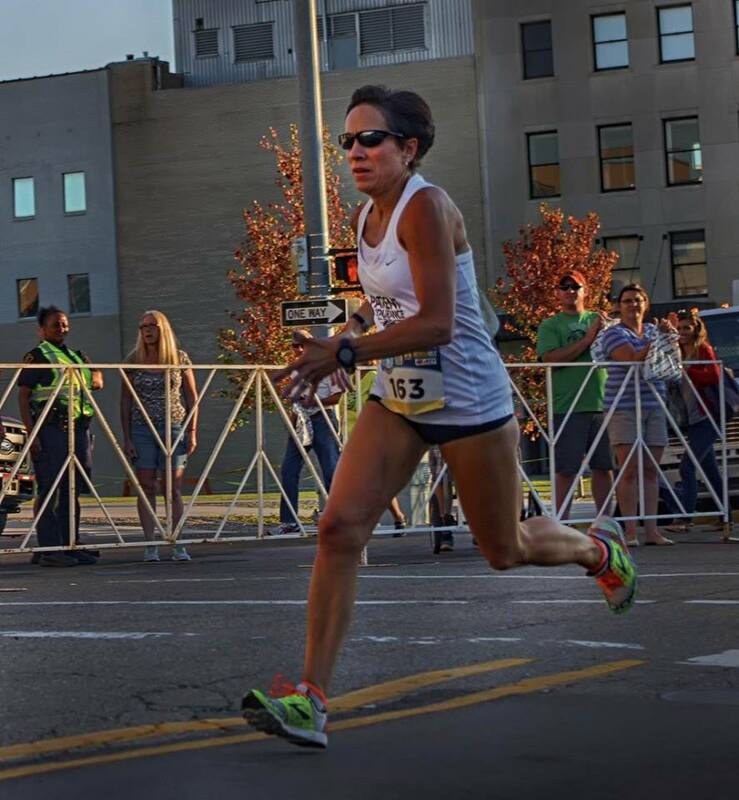 In June she tested her speed over 5K, taking first Masters prize at the Brian Diemer Amerikam 5K in 18:20. 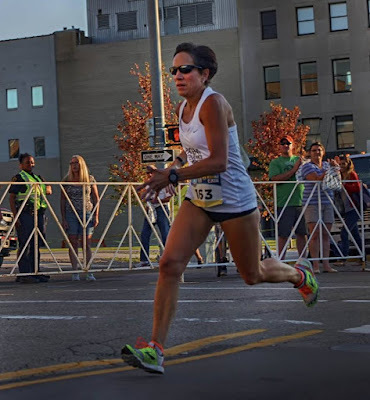 Kessler was not idle either, and can point to three second place Masters finishes at highly visible road races in 2016—the Capital City Half Marathon [May] in Columbus OH, with a 1:25:53; the Fifth Third River Bank 25K Run [May] in 1:43:09; and the Dexter-Ann Arbor Half Marathon [June] in 1:26:32. 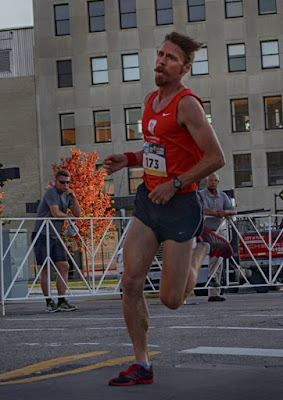 Gacek finished first at the Fifth Third River Bank Run in 1:39:28 and followed that with a Masters win in the 1 Mile Run at the Medtronics Twin Cities Mile Run in late May in 5:26.6. 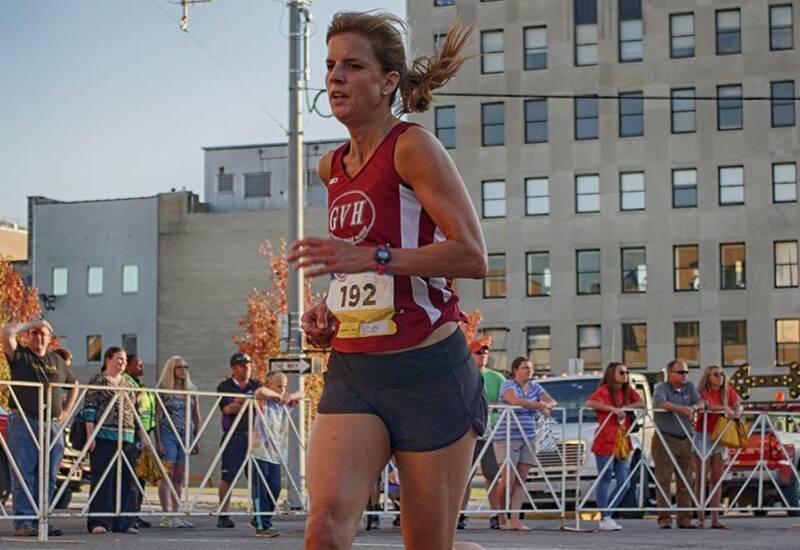 She continued to see-saw back between longer and shorter races over the summer, claiming the masters win at the Garry Bjorklund Half Marathon (at Grandma’s Marathon) in Duluth in 1:22:45. A month later she took 2nd in the Women’s 40-44 Division in the 1500 Meter Run at the USATF Masters Outdoor Championships in 5:02.5. Unlike the other three, who all occupy the Women’s 40-44 age group, Strange is 53, but she is a very speedy 53 over the middle long distances. 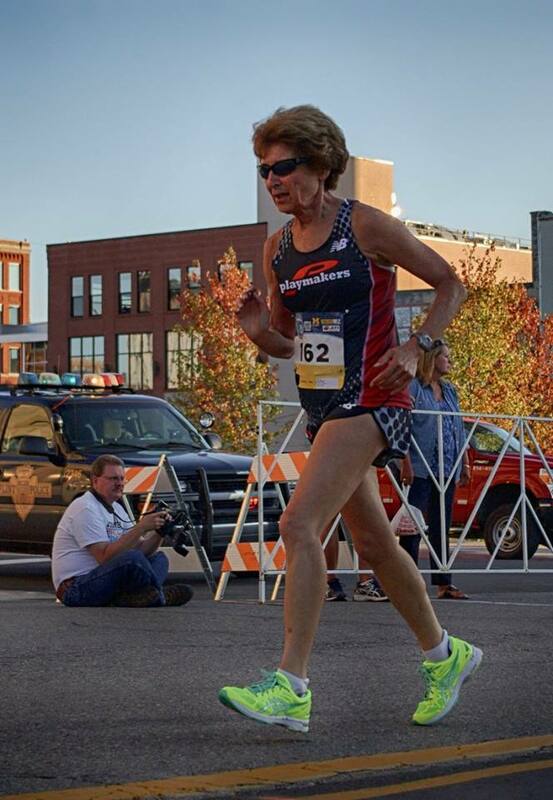 She earned her Runner of the Year title by not only taking age division prizes but overall prizes at USATF Masters Championships. She won the 2015 USATF Masters 5K Championship at Syracuse last October in 17:38, and the 2016 USATF Masters 10K Championship at Dedham MA this past April in 36:48. She was also the top Masters finisher in the Freihofer’s 5K for Women in June in 17:41. Finally she won the Women’s 50-54 Division Championship in the 1500 Meter Run at the USATF Masters Outdoor Championships in 5:09.1. From the 1500 meter run results it looks like Gacek might have an edge over Strange but that impression could be misleading. Gacek ran only the 1500 meters whereas Strange may have been still feeling the effects of her win in the 5000 Meter Run three days earlier. On the other hand, the winner in that race kicked away to win by 7 seconds and Gacek was not pressed for 2nd place. Nowik should have a slight edge, perhaps home field advantage, over Gacek although many of their accomplishments seem comparable. Kessler and Veneziano seem a half step slower but the race may tell us otherwise. This should be a terrific competition. Nowik, Gacek, Strange. Women. 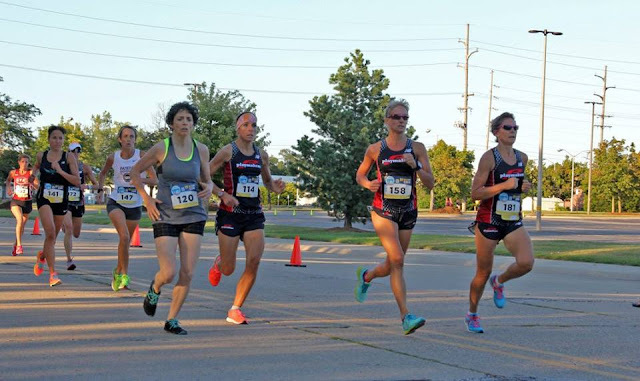 Among returning runners the top age grading performances last year were turned in by: Lisa Veneziano (83.7), Lorraine Jasper (82.9), Christine Vincent (82.4), Maryellen Stornant (82.3), Tammy Nowik (81.0), and Amy Nemeth (80.1). Marisa Sutera Strange will surely join the list and almost certainly top it this year; she typically grades well over 90%. That will be hard to do here as the Age-Grading on this Mile Course typically is lower than normal by a percentage point or two; it is a challenging mile course to run fast on. 40-44. Gardiner, McConnell, and Richendollar, mentioned above for the overall race, should make up the podium in the division. If any of those fail to start or run into problems, Josh Harter, a low 17 minute 5K specialist or Lee Shaw who has run a 17:00 5K and a 1:20:34 ½ Marathon this year, could factor in. Gardiner, McConnell, Richendollar. 45-49. Vermeulen who I have topped as a podium contender should certainly take the M45 gold medal. He is bringing along a new Cal Coast teammate, Michael John Stanley, who will be in the hunt for silver. He ran a 5K recently in 17:13 and clocked a 2:52:25 Boston Marathon in April. Local runners in contention include Eric Green of Pontiac Michigan who finished 6th here last year in 5:07 and ran a 30:52 8K a month ago. Thomas Preiss battled Green to the finish line last year, recording the same 5:07 time. He typically seems to run between 17:30 Derek Dexter ran an 18:37 5K recently, but last year he ran a couple of 5K’s in 17:26 and 17:37 so he may be rounding into shape and could also challenge. Vermeulen, Stanley, Preiss. 50-54. Larson should be a safe bet for Gold. After that it will be the usual battle among several longtime rivals in this group. Mike Nier, of the Genesee Valley Harriers, won here last year in 4:52, and pretty much the same set of rivals are here to try to keep Nier from snagging another podium finish. Ruben Henderson and Eric Stuber of Playmakers Elite/New Balance trailed Nier to the line, 7 seconds back in 4:59; both had the same time. Their teammate, Tim Lambrecht, was another 8 seconds back. Jeff Haertel of the Atlanta Track Club will also try to complicate things. He ran a 17:55 and an 18:20 5K this summer. Haertl and Henderson’s times in 5K this year are quite comparable but Stuber and Nier appear to be running slightly stronger so I will give those two the edge in the pick and give Stuber the edge over Nier on the grounds that he may have more motivation to reverse the order of finish from last year. Larson, Stuber, Nier. 55-59. Last year Dave Bussard came up from Indiana to scorch this group, winning by half a minute in 4:57 but he has another engagements this year. In his absence, the second place finisher from San Jose California, Antonio Arreola, is back and is one of the favorites. Last year Michael Young and Hugh Kuchta trailed Arreola to the line in 5:37 and 5:43. They are both entered again but have a new contender to reckon with. William ‘Hugh’ Enicks is making the trip from Chattanooga this year; even though he prefers longer races, he will be a force to contend with. Currently tied for the lead of the Men’s 55-59 Division of the 2016 USATF Masters Grand Prix, Enicks has had strong runs in the 8K and Half Marathon national championships this year. He tied for 2nd in the 8K, running 28:50 and took 2nd outright in the Half Marathon in 1:20:22. Arreola and Enicks both ran in the 2015 8K Championships with Enicks besting Arreola on that occasion by 40 seconds when he ran about the same time as in 2015. Based on that result, I give Enicks the edge. Unfortunately for those two, Playmakers was able to replace Bussard with someone wh appears to be just about as fast in Kerry Barnett from Keego Harbor Michigan.Barnett was 3rd Masters Overall and first in M55 at the Crecent City Classic in New Orleans in a fast 35:03. At the recent Brian Diemer Amerikam 5K he took the Grand Masters Championship in a smoking 16:53! Maybe Barnett will give Enicks a chance to get even at a half marathon sometime. Barnett, Enicks, Arreola. 60-64. Last year Tom Bernhard and Mark Rybinski ran it right to the wire where Bernhard got the edge with a lean as they were given the same 5:21 time. Both are back but Bernhard has moved up to the 65-69 group so they may again have a terrific race but will get different age group awards anyway. The next two runners in were Doug Bell and Peter Mullin, both of whom have also moved up to 65-69. So Rybinski is the favorite. Can anyway challenge him? Ken Youngers of the Atlanta Track Club did not compete here last year but has just moved up to the 60-64 group this summer and is ready to roll. Both Rybinski and Youngers have had occasional injury issues over the last couple of years so even head to head races can be tricky to judge. Nonetheless, looking back at the 5K and 10K national championship races at Syracuse and Dedham suggests that Youngers should be able to outrun Rybinski at those distances. Who gets third? Last year, at least among those returning, Genesee Valley’s Bill Beyerbach beat out Ann Arbor’s John Tarkowski and Wally Hayes. But Tarkowski and Hayes have been battling injuries this year and ran well below their normal standards at Dedham in April. That suggests Beyerbach may have the edge; he came in ahead of both at Dedham. But both Hayes and Tarkowski appear to have healed somewhat with Tarkowski showing greater improvement, as witnessed by a 21:03 5K in the Dexter-Ann Arbor run and a 5:48.5 one mile run. Unfortunately I note a 36:02 8K in late July. Unless the Northville 8K is unusually challenging, I worry that Tarkowski may have been feeling pain or re-injured something. Tarkowski is a tough, tough runner but he has had a difficult year. Youngers, Rybinski, Beyerbach. 65-69. As mentioned above, Tom Bernhard and Peter Mullin have moved up to the 65-69 group now. Bernhard has been unstoppable among his immediate peers and that should continue in this race. Mullin is running stronger again after a couple of down years but he cannot compete with Bernhard right now. Nonetheless Bernhard and Mullin should take the top two spots on the podium. 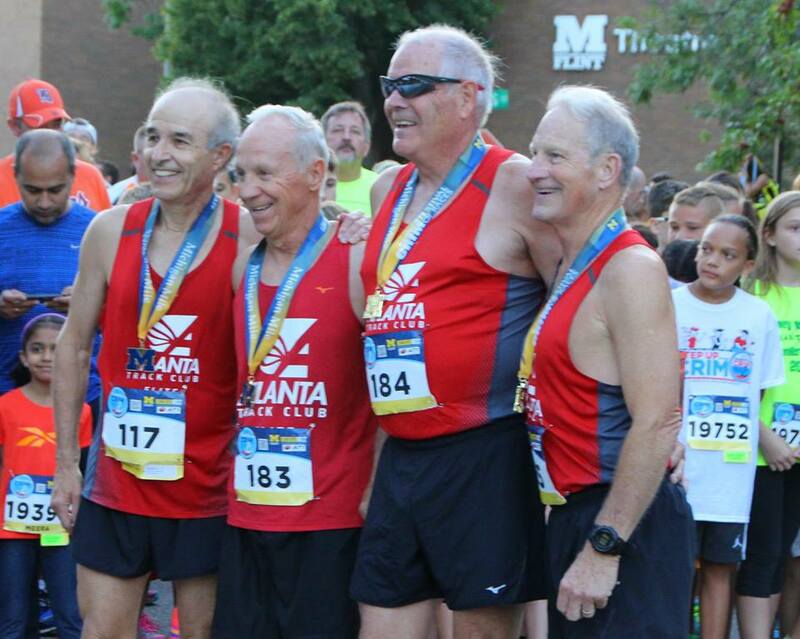 Kirk Larson, one of the mainstays of the Atlanta Track Club has also moved up to the 65-69 group and could well take the age group bronze medal. He ran 40:55 at Dedham in the 10K. Doc Rappole of Genesee Valley is the defending Champion. A couple of years ago he was competing at the top of the 65-69 group when he took the age group gold medal at the USA Cross Country Championships in Boulder. But like so many others, there have been challenges since and his most recent times are a bit slower than Larson’s. It would be great to see him give Larson a real race for the third place! Bernhard, Mullin, Larson. 70-74. The top three runners last year were Doug Goodhue, Jan Frisby, and Gerard Malaczynski. Frisby is focused on the World Masters Athletics Championships in Perth, Australia and Malaczynski has not entered this year either. Goodhue has an injury so it is uncertain if he will run. If he ‘runs for the team’ it may not be up to his usual standard. That leaves it pretty much wide open. Paul Carlin (yep, that’s me!) won the USATF 10K Championship in 42:19 after coming back gradually over a year from a right hamstring injury and hoped to compete for a podium spot. But less than a week after that race, his left hamstring gave out. Like Goodhue, he may ‘run for the team’ but does not expect to break 8 minutes and may not break 9 minutes; he is just running to finish. Those developments make Gary Patton even more of a favorite. Because Patton is a middle distance specialist, it is unlikely that Carlin or Goodhue, even at their peak form, could best him in a mile run. After all, Patton holds the Men’s 65-69 mile record on the track and his record for 70-74 year olds is pending! Who looks good after Patton? Ordinarily I would say Przemek Nowicki, who finished 3rd at Dedham behind Carlin and Patton. But Nowicki injured one of his quads a few weeks ago and is not at his peak fitness. Nonetheless, he should be able to break 6:45 and that may be enough to make the podium. His teammates, Ed Smith and J.L. Seymore were quite a ways back in the Half Marathon Championships. What about the Atlanta Track Club? Could Charlie Patterson, Frank White, or Morris Wiliams make the podium? 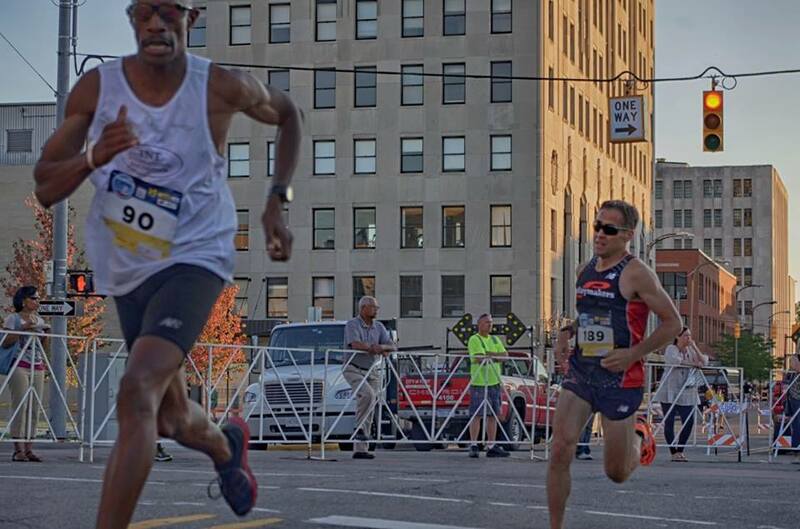 Both White and Williams beat Seymore in the .US National 12K last November. But Seymore beat Patterson in the 10K at Dedham this year. White beat Seymore in the 5K Championships at Syracuse last year, but Seymore beat Williams. And Seymore’s best 10K time this year is faster than Patterson’s. And, finally, looking back at last year, Williams beat both Patterson and White in this race. So it should be a bit of a barn burner—and will depend on who has the best fitness and is feeling the most moxie on the day. Patton, Nowicki, Williams. 75-79. Last year Harlan Van Blaricum was the only entrant in this Division and won by a mile (literally)! This year Van Blaricum is not registered but three others are. Ron Mastin of the Atlanta Track Club is the favorite. 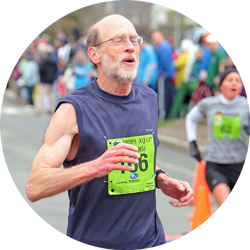 He won the 5K Championship in the age group in Syracuse last October in 23:07 and added the 10K Championship in Dedham in 49:41. Sandy Scott might have given him a battle but has been suffering from a chronic hamstring problem. He is not sure what to expect in the race. Phillip Kroll has been running well and may surprise. Mastin, Kroll, Scott. 80+. There were no entrants in this age group last year. This year Jon Desenberg is the class of the field. He literally has no competition for the gold medal. 40-44. As suggested by the discussion of the Overall Masters Race, Nowik, Gacek and Kessler should make up this group’s podium. Should any of those falter the top Genesee Valley Harrier teammates, Melissa Senall and Wakenda Tyler will be poised to push past and claim a podium spot. Nowik, Gacek, Kessler. 45-49. Last year this was a tightly contested group with Amy Nemeth taking 1st in 5:49, followed by Erin Larusso in 5:55 and Liz Bondar in 6:03. Nemeth and Larusso are back but Bondar is not so Nemeth and Larusso start out as favorites. Are there new entrants to challenge them? Nicole Derrick and Amy Wing appear to have the credentials to go 1-2 in this division. Derrick has two sub-1:29 Half Marathons and Wing has one. Although both seem to excel at longer distances they can also crack 20 minutes in a 5K, with Derrick clocking a 19:41 and Wing a 19:06. Neither Nemeth nor Larusso have a recent sub-20 5K but Larusso does have a 5:49 road mile time while Nemeth has only been able to manage a 6:00.1 this year. 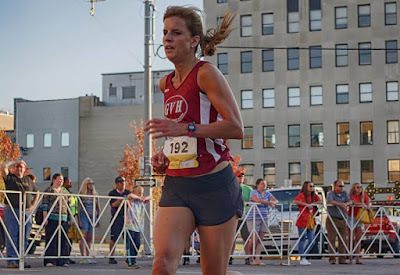 Audra Naujokas-Knapp of the Genesee Valley Harriers, and winner of the 2015 Women’s 45-49 Grand Prix, appears ready to compete if any of the others falter. Her 5K in Syracuse last fall of 20:10 suggests she can be competitive at the short distance if she has a good day. Wing, Derrick, Larusso. 55-59. Last year there were three entrants, Maryellen Stornant, Colleen Magnussen, and Veronica Jackson. The top two are back but face no new competition. Last year Stornant took the first place by over a half minute so she is the favorite to defend her crown. Stornant, Magnussen. 60-64. The only one of the top 3 finishers from last year who are entered this year is Jean Bolley who finished 3rd in 7:52. There are a number of challengers who will try to move her off the podium. Jill Miller-Robinett of the Impala Racing team out of the Bay Area in California finished 4th in the National 10K Championship in Dedham in a time of 46:49; her 5K times are typically between 21:30 and 23:30. It appears her 5K times are just a little faster than the typical times recorded by the Atlanta Track Club duo of Mary Richards and Margaret Taylor. Miller-Robinett, Richards, Taylor. 65-69. Last year the illustrious Sabra Harvey was the only contestant in this group which, despite being on the comeback trail from a freak foot injury, she won in 6:25. The only other age group winners to best that time were in the three youngest groups, and it was the top Age-Grading performance at 90.77%. Harvey is not here this year but there are two contestants so it will be a more competitive race this year. Donna Chan from the Impala Racing Team of California is toeing the line next to Patricia Degnan of the Playmakers Elite/New Balance team out of Lansing Michigan. It should be competitive but I give the edge to Chan. She has run 5K’s in 23:53 and 23:59 this year along with a 7:21 road mile. 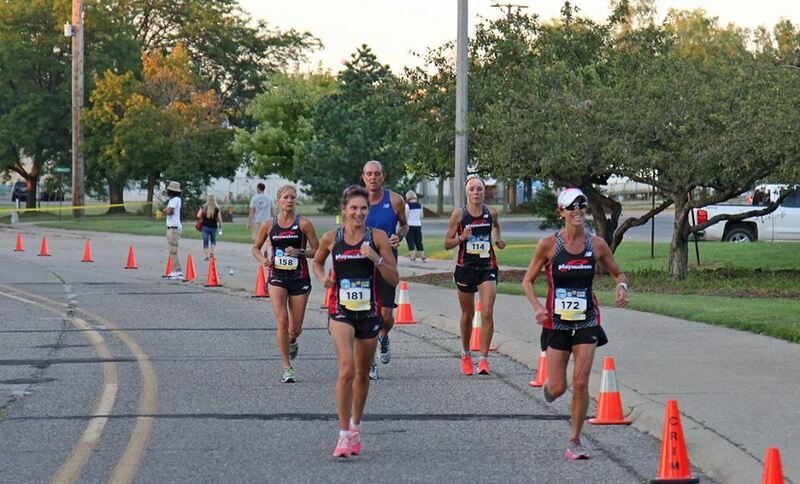 Degnan might be better over a longer distance; she ran a 2:14 in the Detroit Free Press Half Marathon last October. Her most recent 5K is a 25:25 effort two years ago. Chan, Degnan. 70-74. Last year Ruth Thelen had a large margin of victory in this group with a 7:59. Cora Hill and Shirley Larsen took the other two spots on the podium in 9:33 and 9:46 respectively. Thelen and Hill are back and have a new challenger in the Impala Racing Team’s Dianne Anderson. It appears that Anderson is a worthy challenger for Thelen. Thelen has run 5K’s this year in 28:49 and 28:12; Anderson ran 28:48 and 28:05. I give a slight edge to Thelen as she has run the shorter distances more frequently. She won the 1500 meters in her USATF Outdoor Championship division in 7:30 which converts to a bit over 8:00 for the mile. But she also ran a recent road mile in 8:09 so she seems to have prepped for the race. Anderson does not appear to have any races shorter than 5K in recent years. Still it should be a thrilling contest. Thelen, Anderson. 40+. Last year the same three teams showed up with Cal Coast Track Club winning handily and Patient Endurance edging TNT International with the difference going down to the 3rd runner. Christian 'Cush' Cushing-Murray could not make the trip this year for Cal Coast. With the race on the last Friday of August his teaching commitments kept him in California. Vermeulen and Gardiner are here and have added Michael John Stanley as a substitute. While Stanley is not a perfect substitute for Cushing-Murray, it looks like Cal Coast will not lose much. And that is good for them because Patient Endurance has upped its game a bit with the addition of Derek Dexter to the trio of Eric Green, Thomas Preiss, and Mark Good, who scored for them last year. . My best guess is that the contest will come out the same this year with Patient Endurance 2nd to Cal Coast but with a slightly narrower margin however. With TNT bringing the same team as last year, those 3 runners, the brothers, Kyle and Kareem Lanier, along with Stephen Jones, will have to raise their game to get into the Silver Medal position. Cal Coast TC, Patient Endurance Racing, TNT INternational. 60+. In 2015 the GVH 60+ team took the gold with Ann Arbor TC A team 2nd and their B team 3rd. This year Ann Arbor is only able to field a single team as some of their injury woes continue. But the GVH team is here in strength and a newly rejuvenated Atlanta Track Club 60's team could well slide into the top spot. As noted earlier, Ken Youngers can now run for Atlanta's 60's team and he should be able to give the 2nd and 3rd runners a good lead to build on. Kirk Larson rejoined Atlanta after a year away and he is always reliable for a good race, although a 1 mile run may be a little short for his taste. Larson ran a 19:54 5K a week ago so he is ready to roll. And Jerry Learned may be right with him. He ran a 5:42 1500 meter in the Outdoor Track Championships [roughly equivalent to a 6:10 mile] and hit 19:15 in the Hollis Fast 5K (although there is a good reason why Hollis includes the word 'fast' as part of their title). Still it is 45 seconds faster than he ran it the year before so maybe Learned has finally put some of his recent injury problems behind him. Ann Arbor, on the other hand, appears to still have some lingering injuries that will hamper them again this year. GVH appears to be in good form but the likely top three of Rubinski, Beyerbach and Rappole will have too much for Tarkowski, Hayes, Pratt and Matsuo to handle. And if Youngers can come in well ahead of Rybinski, that might be all Larson and Learned need to nail down the victory. It will be fun to see it unfold. Atlanta TC, GVH, Ann Arbor TC. 40+. In 2015 Patient Endurance Racing won a surprisingly close battle with Playmakers Elite/New Balance. Despite the presence of Patient Endurance runners Nowik and Kessler who finished 1-2 and Erin Larusso who finished 6th, the Playmakers top trio of Amy Nemeth, Christine Vincent and Sharon Becker made it interesting losing, in the end by only 42 seconds.This year with the addition of Amy Wing and Nicole Derrick, Patient Endurance is much stronger. They should generate an even larger winning margin this year. Unfortunately for Playmakers Vincent moved up to the 50+ team this year. And with Becker not competing this year the Playmakers team which added Chere Pepper and Jennifer Stuber is not as strong as last year. 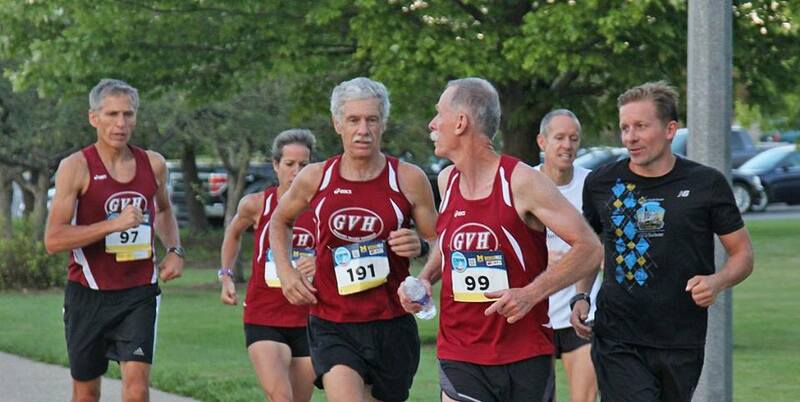 The Genesee Valley Harriers are bringing their 40+ team that won the USATF Club Grand Prix last year. The team of Melissa Senall, Wakenda Tyler, and Audra Naujokas-Knapp appears to have little chance of running withthe Patient Endurance runners but should be able to claim the Silver medal. The TNT International team of King, Lanier and Manns should make things interesting in the run for the Bronze medal but I give Playmakers the edge. Patient Endurance Racing, GVH, Playmakers Elite. 50+. Last year it was a battle between the two longtime rivals, the GVH and the Athena Track Club, with Athena's trio of Jasper, Pangburn and Stewart coming out ahead of GVH's Bischoff, Magnussen, and Geiger. Those two teams are back intact but face a new rival in Playmakers Elite. Vincent and Stornant moved up from the 40+ team to form the base. Added to it are Jean Bolley and Patricia Degnant. Athena should have no trouble taking the gold again. But Playmakers could take the Silver Medal away from GVH if they are all on their game. Vincent and Stornant should gain some time on Bischoff and Magnussen and then the question is whether Geiger can come in far enough ahead of Degnan (or Bolley) to reverse the early lead. This will be another fascinating one to watch. Athena TC, Playmakers Elite, GVH. 60+. In 2015 the Playmakers Elite 60+ team had this race to themselves. They are not contesting the event this year but two traveling teams are. The 60+ Impala Racing Team from the Bay Area in California have their sights on a Club Grand Prix title and this is one of their building blocks. But the Atlanta Track Club is hoping to throw a wrench into the works. One of Impala's top runners, Jo Anne Rowland is out and that means Impala cannot rely on a 1-2 finish to build a lead. It is likely that Miller-Robinett will be the first across the line. But once the first Atlanta runner crosses, probably only 15-20 seconds after Miller-Robinett, all three should come in ahead of Impala's other two runners, Chan and Anderson. That should give Atlanta the Gold. Nothing too shabby about a 2nd place in a National Championship however, and it still counts for 90 Club Grand Prix points. Atlanta TC, Impala. 70+. The Playmakers Elite/New Balance team of Ellen Nitz, Cora Hill, and Shirley Larsen had this division to themselves last year. And it is the same in 2016 except that Ruth Thelen replaces Larsen. It looks like another National Team Championship for Playmakers! Playmakers Elite.